As a pianist, you may be asked to accompany a solo singer for a performance or recital. 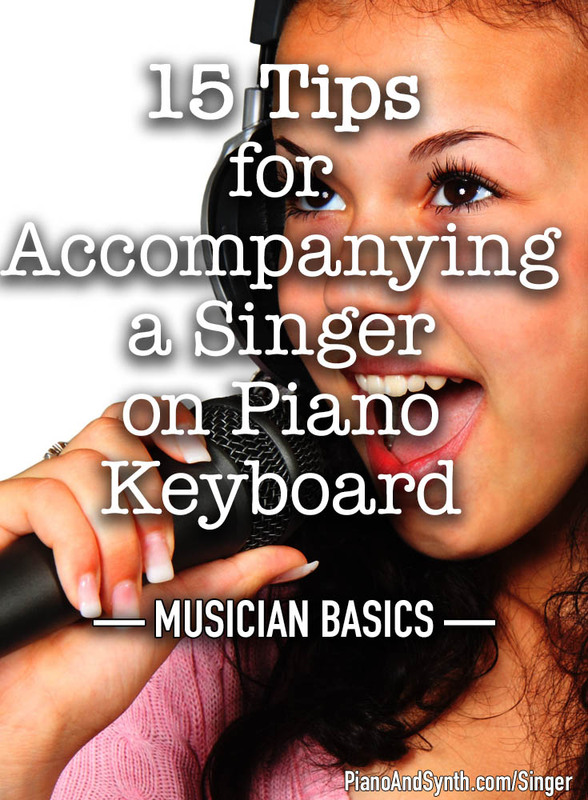 While this may be a nerve-wracking concept, follow our tips and you’ll soon be a pro accompanist! Once you know what song or songs you will be accompanying, get hold of appropriate printed music. Often, the more minimal you can be, the better. If you are confident playing from chord or lead sheets, and the style of music allows for it, then generally you’ll get more music on less sheets of paper. If you can only get full manuscripts, it may be possible to create a chord or lead sheet from it quite quickly (or ask someone else to do it). It takes much more time and effort to turn a chord or lead sheet into a full music manuscript. If you have a tablet, you may wish to use that for music scores and chord sheets, although many tablets are not large enough to display a complete page of music score at a reasonably comfortable magnification. Whether or not you have any ability to play by ear, there’s no doubt that learning the music will hold you in good stead for accompanying. If you can find a recording that’s close to the arrangement you’ll be playing, listen to it until you are familiar with it. While alone, learn each piece of music on your piano, paying attention to any parts which are more difficult or are particularly important to the performance. There are some parts in the instrumental accompaniment which everyone expects to be played a certain way, especially when the song is well known. That said, if you can strip back the accompaniment to make it simpler, it’s worth doing, particularly if you aren’t feeling super confident. It’s better to play a simpler arrangement well than struggle and falter on a more complicated one. Generally, you should consider yourself to be foundational to the singer’s performance, rather than seeking to shine in your own right. The better your relationship with the singer, the more natural the final performance will be. If you don’t already know the singer well, it’s worth spending some time together (maybe in a group) simply socialising. While you can’t hit it off with everyone you work with, making the effort, beyond simply the technical aspects, will pay dividends. It’s obvious you’ll need to practice together as much as possible before the performance. At your initial practice you can run through the basic elements on which the performance will be built. As your practices go on, you can move closer to playing the final pieces as they will be performed. Ideally you want a couple of practices where you run through the whole performance as if it were the final, live version. Your singer will look to you to provide the foundation to their performance. Exude confidence. Of course you should be honest about how you’re feeling, and avoid being fake, but that doesn’t mean you can’t push the positivity button even if you’re not firing at 100% yet. It will help you, too. Be consistent. Consistent in how you play. Consistent in how you work with the singer. Consistent in your practice times both alone and together. Be reliable. Communicate well. Stick to agreed practice times. Don’t break promises you’ve made. Be strong. You can be the foundation not only musically but emotionally. If your singer is feeling nervous or stressed, you can help to build their confidence. As the sole instrumentalist, it’s your job to set the tempo, provide the rhythm and groove. Basic time keeping is a necessity when accompanying another singer. You can also provide accent cues to signal the main bars (measures) to the singer. Set a pitch for each song which is comfortable for the singer to sing. Some songs may require transposition. You may need to compromise to find a musical key that is comfortable to sing all the notes and easy enough for you to play. If you’re playing a digital piano or keyboard with a transpose function it may be easier to use that feature if the key needs to be changed but you find it easier to play in a different key. This luxury won’t be available if you’re using an acoustic piano. You’ll generally need to play with a similar (but slightly lesser) volume to that of the singer. This means working on the overall dynamics of the piece and knowing where the song gets louder and quieter. If you’re working from a full music manuscript, the standard dynamics may well be marked already. On a chord or lead sheet, you may need to add your own written notes to remind you how to play different sections of the song. Although keeping an accompaniment simple is worthwhile, there may be times when a particular melody or hook line should be played, particularly if a well-known recording of the song features a recognisable piano part. As well as adding colour and texture to a song, some melodies and hooks can help to provide auditory feedback to the singer when moving between song sections. If you do want to put in a recognisable or important hook or melody, be sure you practice it enough to be confident playing it. If it’s too difficult for you to play it would be better to leave it out. These are important markers in songs and help the singer (and, to a lesser extent, the audience) know where in the arrangement they are. Intros and fill-ins between song sections are particularly important. The introduction sets the pitch and speed of the song. It may be necessary to provide a subtle ‘cue’ note which directs the singer to the first note to be sung, if the piece isn’t obvious or the singer is struggling with it. Generally, accompanists don’t play the melody when someone is singing it, sticking instead to chords, fill-in notes, or possibly a non-intrusive counter-melody (this needs to be worked out and practiced in advance). That said, there may be a call to play some or all of the verse, chorus, bridge or some other part, during a rehearsed instrumental section. In this case, ensure you know which part needs to be played and ensure you can play it well. As you build rapport and practice the songs, you should also work on a subtle method of communication that will allow you to signal to one another even during the performance without it distracting the audience. This will help beyond the auditory clues and signals mentioned above. For example it might be the way you count in a song, signal a need to speed up or slow down, or offer encouragement during the performance. Most general audiences are not musical aficionados. They will appreciate a performance which is skilfully delivered but would be unlikely to pick out any but the most glaring mistake or pause. You, as performers, will be much more likely to notice mistakes and ‘fluffs’ than the audience. As you have invested a great deal of time, energy and emotion into this, they may seem like catastrophes if (when) they happen. Don’t let them throw you off balance. If you or the singer miss a cue, you play a wrong note or chord, or something else relatively minor happens, keep going. Try not to let mistakes fluster you. Maintain your composure and carry on. Remember the venue in which you are performing may be very different from where you have practiced. The acoustical qualities of the room, the number of audience members, and the layout will all affect the sound. In larger venues or where you want some impact, the singer will probably use a microphone. An acoustic piano probably won’t need much amplification except in larger rooms where the acoustics are dampened, but a digital piano or keyboard will need some form of amplification. You’ll need to check in advance what equipment is available and who will operate it. Ideally you want someone competent to ensure the mix/balance of the sound is good. Set up a mix that sounds good during the final rehearsal in the venue, and then have the sound adjusted as required during the performance. Tastes vary, but generally you’ll want a mix which accentuates the singer’s voice, while the piano is slightly quieter with a well-rounded tone. 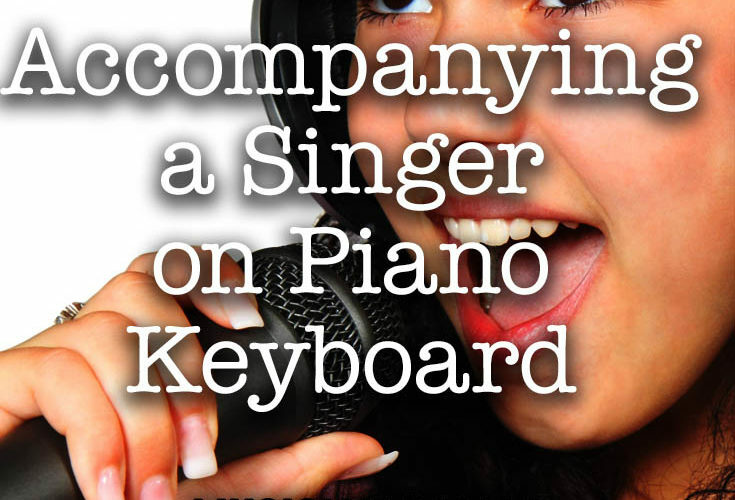 Accompanying a singer on piano needn’t be a daunting experience. Be prepared, relax, and enjoy the experience.